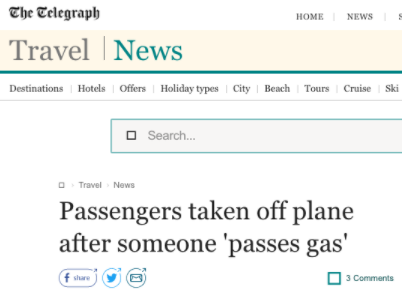 In today's "Not The Onion" news, an American Airlines flight supposedly had to evacuate all its passengers after a person "passed gas," causing violent episodes of nausea and headaches. Except that this isn't true. 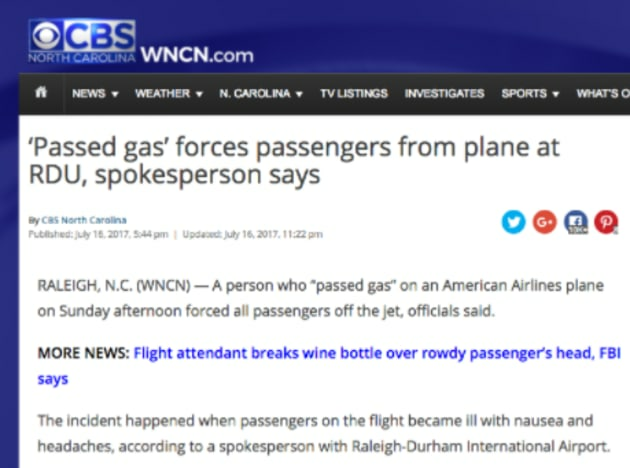 The story, which originally appeared on local WNCN-TV, quotes an unidentified spokesperson with Raleigh-Durham International Airport as saying that all passengers were taken off the plane after it landed at around 4 p.m. The incident allegedly started when passengers on the flight "became ill with nausea and headaches" spurred by a foul-smelling odor in the cabin. However, American Airlines spokesman Ross Feinstein categorically denied this report. Feinstein told Mashable that "the flight was not evacuated, and the story is not true". He said the plane had a odor issue, but that was due to a mechanical fault, not "passed gas." "We did have an aircraft from Charlotte to RDU this afternoon, that landed at 2:19 p.m. ET, and arrived the gate at 2:21 p.m. ET, that is currently out of service for an actual mechanical issue – and odor in the cabin. But it is not due to 'passed gas' as mentioned," Feinstein said. "A medical call for someone overcome by an odor was received after the plane deplaned normally," he said.